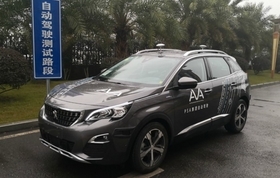 PSA is using a Peugeot 4008 SUV to test its self-driving technology in China. PSA Group has obtained a license from local authorities to test an autonomous vehicle on roads in the southwest China municipality of Chongqing. The automaker is using a self-driving Peugeot 4008 crossover, which was assembled at PSA’s joint venture with Dongfeng Motor Group. Three European luxury car brands -- BMW, Audi and Mercedes-Benz -- have already received permits from other Chinese cities to test self-driving vehicles on local roads.